As unreasonably beautiful as this prized instrument appears, the loveliest part is actually its sound. It resonates with unflinchingly clarity and precision that has a surprisingly rich ring that lingers. Curly Vine & Moustache’s ample volume has wonderful intonation and great playing action. It's both a pleasure to perform with and fantastically good looking. The grade AAA Hawaiian Koa is one of the most premium Koa woods harvested, or as they say in Hawaii, it’s da kine. 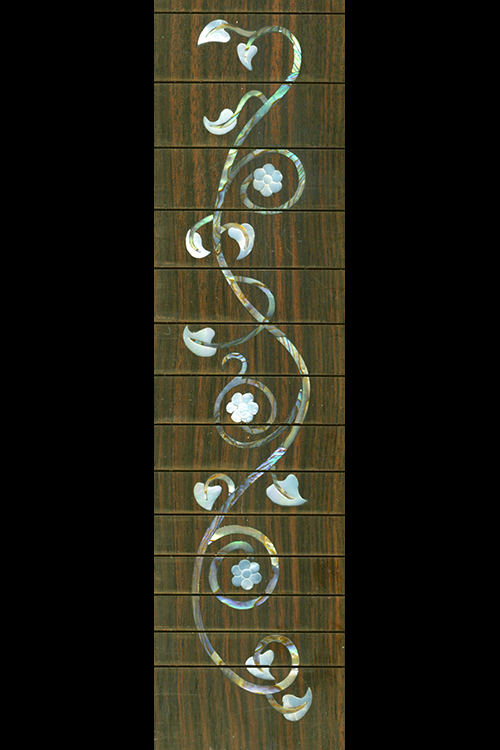 Wood this special needed a design that was as stunning to compete with its materials- as a result the black ebony fretboard is intricately inlaid with white mother of pearl and blue-green Paua pearl creating a delightful curly vine motif. The soundboard is surrounded with a bird’s eye maple edging and the mustache inlay at the base of the soundboard is also maple. The string-thru bridge is maple and ebony, and the top is set with a 4:1 ratio Peg-Hed planetary tuners- which makes tuning simple and easy. The nut and saddle are made of bone. The back of the instrument is arched on both axis which creates a bowl shape. This signature arched back is found on all Pohaku ukuleles and contributes to its lush sound. The neck is crafted with genuine quarter sawn Honduran Mahogany and the fingerboard is composed of clean black African ebony. The fret work is extremely well made and the smallest frets are easy to play with good intonation. Curly Vine & Moustache’s finish is silky smooth, complete with a gloss lacquer. Attention to every detail has been made with this instrument, as with all Pohaku instruments, which are all handcrafted and utterly unique. The ukulele is approx. 26” long and weighs about 21 ozs.